I've heard that there is a rule of thumb that the space left for the battery in a case should be around 10% larger (I suppose primarily in thickness) than the nominal dimensions to allow for expansion. Extra 10% seems quite large. Where does this rule of thumb come from? Is there any official recommendation for how large a compartment to put lithium polymer cells in? How much do these batteries expand and shrink in normal use? 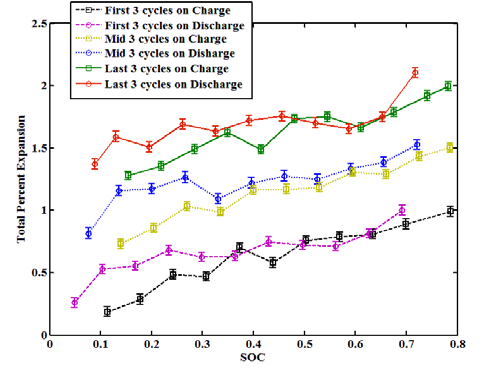 For example during charging/discharging cycles, temperature cycles over normal temperature range (-20C to 60C), etc. What happens if the battery is in a rigid compartment in the case of malfunction? 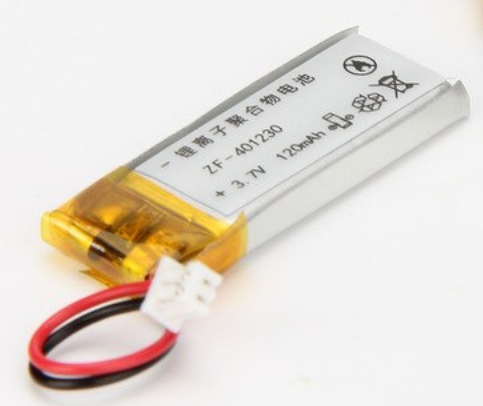 It's pretty common to have batteries "puff out" if they get shorted internally, but what happens if the battery is in a compartment that prevents expansion? (Assume the compartment is strong enough to withstand the pressure build up) Does the pressure/walls make the short worse, or better? One could use these numbers for a baseline, but it's not that hard to make these measurements to a reasonable degree. Since batteries are made with different anode\cathode and electrolyte combinations that vary from manufacturer to manufacturer, it would be wise to consult the manufacturer on swelling or measure it. If you really want to find out how much your battery is swelling, get a micrometer and measure it discharged, then measure it fully charged and see what the difference is. Measure the cell under maximum discharge, because the cells swell more with thermal expansion. 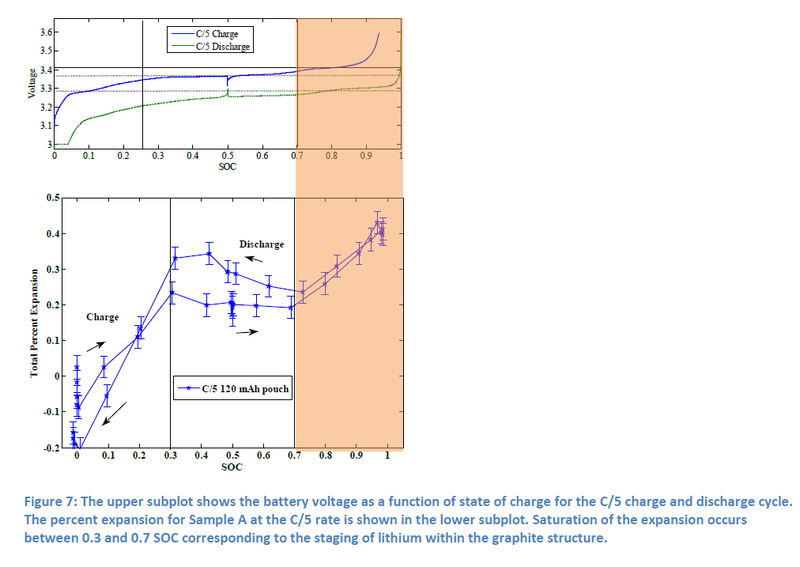 Give your self additional margin to account for differences in batteries and manufacturing tolerances. Cells also bulge more in the middle if they are heated then the outside. So make sure you measure the middle of the cell. Although I cannot compete with the wealth of detail given in previous answers, I think it might be helpful to give you an example why this much extra space is used for a good reason. A Lipo does not only swell during normal operation with temperature and charging/discharging, but also when it ages. Have a look for electrolyte decomposition to find more about this phenomenon, but ultimately it breaks down to the creation of gases (mostly oxygen) inside the LiPo. Just to give you an idea about what you can expect: A frequently used 3.5 year old battery I measured during writing this expanded from 25mm (according to the reseller, couldn't find a datasheet) to almost 32mm, which is more than 25%! I guess the datasheet values are not as optimistic as the reseller's ones, but still this is a substancial increase, which should be taken into account while designing your product. If the battery has no room to swell, it will become a possible risk of fire and - in the worst case - even explosion. See the comments on below your question, this has been described by K H in detail. There should be a distinction made between inevitable electrode expansion/contraction due to electrochemistry of electrodes itself at nanoscopic level (which was presented by lapto2d), and "battery swelling/puffing" of pouch-type cells (presented by K.Krull) due to electrolyte decomposition/outgassing, which is a sign of malfunction and/or poor manufacturing quality of a cell. Regarding puffing, there are several theories about it, but it looks like the main cause is some electrolyte decomposition and metal build-up when the cells are left in nearly over-discharged state for long time. The manufacturing issue is related to production process, where the cells are "formed" before being sealed, letting the electrolyte to outgas. If the forming is done sloppy/too fast, the sell still has some gas build-up and will puff over time. Obviously the overall cell expansion in practice is a combination of the two effects, and some studies of well-made cells show expansion up to 4% after 50 cycles, see this publication. While the 0.5%-1% of electrode thickness expansion is natural and can/should be accommodated with some oversize of battery compartment, excessive irreversible puffing is a serious precursor to catastrophic failure. At one point in dealing with customer's issues I came to realization that it would be very beneficial to have a pressure sensor to detect this state before the whole device case gets torn apart. It appears that this idea is already patented, US8717186B2. I strongly recommend to put a pressure sensor inside your design. Not the answer you're looking for? Browse other questions tagged batteries lithium-ion charge discharge lithium-poly or ask your own question. What type of fire extinguisher do I need for lithium polymer batteries?